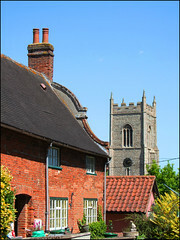 Upper Ufford is a pleasant place, and known well enough in Suffolk. Pretty much an extension northwards of Woodbridge and Melton, it is a prosperous community, convenient without being suburban. Ufford Park Hotel is an enjoyable venue in to attend professional courses and conferences, and the former St Audrey's mental hospital grounds across the road are now picturesque with luxury flats and houses. And I am told that the Ufford Park golf course is good, too, for those who like that kind of thing. But as I say, that Ufford is really just an extension of Melton. In fact, there is another Ufford. It is in the valley below, more than a mile away along narrow lanes and set in deep countryside beside the Deben, sits Lower Ufford. To reach it, you follow ways so rarely used that grass grows up the middle. 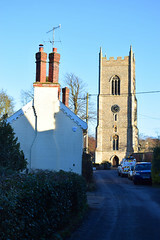 You pass old Melton church, redundant since the 19th century, but still in use for occasional exhibitions and performances, and once home to the seven sacrament font that is now in the plain 19th century building up in the main village. Eventually, the lane widens, and you come into the single street of a pretty, tiny hamlet, the church tower hidden from you by old cottages and houses. In one direction, the lane to Bromeswell takes you past Lower Ufford's delicious little pub, the White Lion. A stalwart survivor among fast disappearing English country pubs, the beer still comes out of barrels and the bar is like a kitchen. I cannot think that a visit to Ufford should be undertaken without at least a pint there. 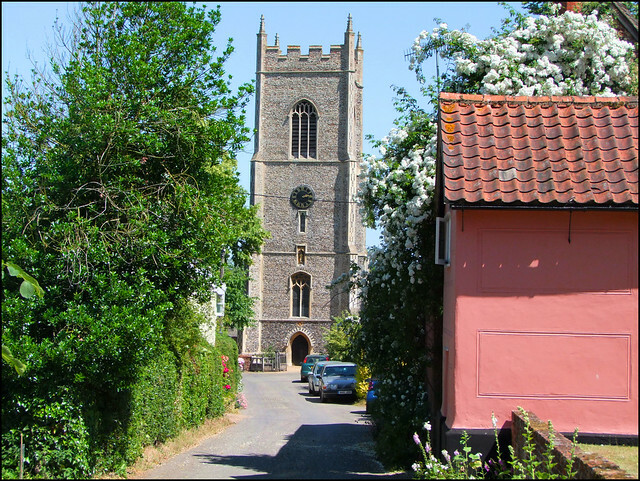 And, at the other end of the street, set back in a close between cottages, sits the Assumption, its 14th century tower facing the street, a classic Suffolk moment. 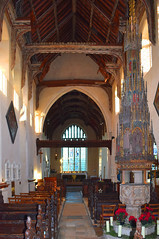 The dedication was once that of hundreds of East Anglian churches, transformed to 'St Mary' by the Reformation and centuries of disuse before the 19th century revival, but revived both here and at Haughley near Stowmarket. 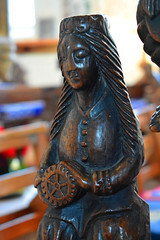 In late medieval times, it coincided with the height of the harvest, and in those days East Anglia was Our Lady's Dowry, intensely Catholic, intimately Marian. The Assumption was almost certainly not the original dedication of this church. There was a church here for centuries before the late middle ages, and although there are no traces of any pre-Conquest building, the apse of an early-Norman church has been discovered under the floor of the north side of the chancel. 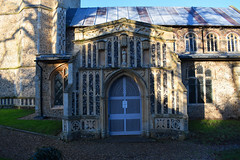 The current chancel has a late Norman doorway, although it has been substantially rebuilt since, and in any case the great glories of Ufford are all 15th century. 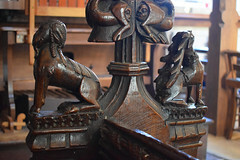 Perhaps the most dramatic is the porch, one of Suffolk's best, covered in flushwork and intriguing carvings. Ufford's graveyard is beautiful; wild and ancient. I wandered around for a while, spotting the curious blue crucifix to the east of the church, and reading old gravestones. 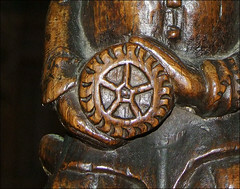 One, to an early 19th century gardener at Ufford Hall, has his gardening equipment carved at the top. The church is secretive, hidden on all sides by venerable trees, difficult to photograph but lovely anyway. I stopped to look at it from the unfamiliar north-east; the Victorian schoolroom, now a vestry, juts out like a small cottage. I walked back around to the south side, where the gorgeous porch is like a small palace against the body of the church. I knew the church would be open, because it is every day. And then, through the porch, and down into the north aisle, into the cool, dim, creamy light. On the afternoon of Wednesday, 21st August 1644, Ufford had a famous visitor, a man who entered the church in exactly the same way, a man who recorded the events of that day in his journal. There were several differences between his visit and the one that I was making, one of them crucial; he found the church locked. He was the Commissioner to the Earl of Manchester for the Imposition in the Eastern Association of the Parliamentary Ordinance for the Demolishing of Monuments of Idolatry, and his name was William Dowsing. Dowsing was a kind of 17th century political commissar, travelling the eastern counties and enforcing government legislation. He was checking that local officials had carried out what they were meant to do, and that they believed in what they were doing. In effect, he was getting them to work and think in the new ways that the central government required. It wasn't really a witch hunt, although God knows such things did exist in abundance at that time. It was more as if an arm of the state extended and worked its fingers into even the tiniest and most remote parishes. Anyone working in the public sector in Britain in the early years of the 21st century will have come across people like Dowsing. As a part of his job, Dowsing was an iconoclast, charged with ensuring that idolatrous images were excised from the churches of the region. He is a man blamed for a lot. 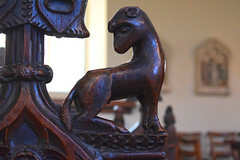 In fact, virtually all the Catholic imagery in English churches had been destroyed by the Anglican reformers almost a hundred years before Dowsing came along. All that survived was that which was difficult to destroy - angels in the roofs, gable crosses, and the like - and that which was inconvenient to replace - primarily, stained glass. 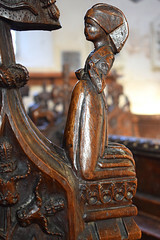 Otherwise, in the late 1540s the statues had been burnt, the bench ends smashed, the wallpaintings whitewashed, the roods hauled down and the fonts plastered over. 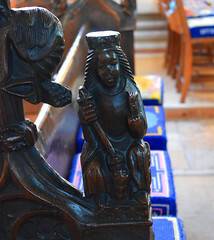 I have lost count of the times I have been told by churchwardens, or read in church guides, that the hatchet job on the bench ends or the font in their church was the work of 'William Dowsing' or 'Oliver Cromwell'. In fact, this destruction was from a century earlier than William Dowsing. Sometimes, I have even been told this at churches which Dowsing demonstrably did not visit. 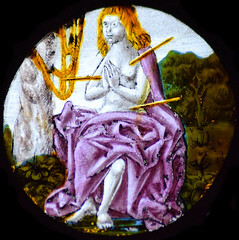 Dowsing's main targets included stained glass, which the pragmatic Anglican reformers had left alone because of the expense of replacing it, and crosses and angels, and chancel steps. We can deduce from Dowsing's journal which medieval imagery had survived for him to see, and that which had already been hidden - not, I hasten to add, because people wanted to 'save' Catholic images, but rather because this was an expedient way of getting rid of them. 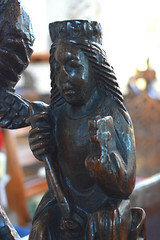 So, for example, Dowsing visited three churches during his progress through Suffolk which today have seven sacrament fonts, but Dowsing does not mention a single one of them in his journal; they had all been plastered over long ago. In fact, Dowsing was not worried so much about medieval survivals. What concerned him more was overturning the reforms put in place by the ritualist Archbishop Laud in the 1630s. 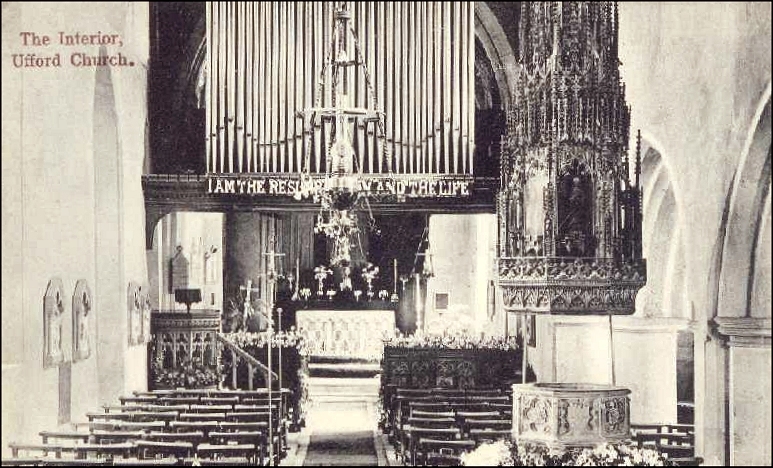 Laud had tried to restore the sacramental nature of the Church, primarily by putting the altar back in the chancel and building it up on raised steps. Laud had since been beheaded thanks to puritan popular opinion, but the evidence of his wickedness still filled the parish churches of England. The single order that Dowsing gave during his progress more than any other was that chancel steps should be levelled. The 21st of August was a hot day, and Dowsing had much work to do. 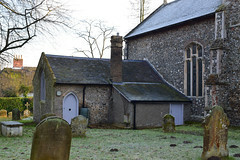 He had already visited the two Trimley churches, as well as Brightwell and Levington, that morning, and he had plans to reach Baylham on the other side of Ipswich before nightfall. 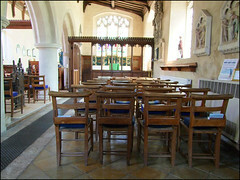 Much to his frustration, he was delayed at Ufford for two hours by a dispute between the church wardens over whether or not to allow him access. The thing was, he had been here before. 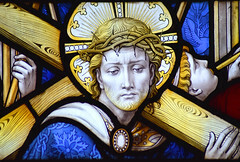 Eight months earlier, as part of a routine visit, he had destroyed some Catholic images that were in stained glass, and prayer clauses in brass inscriptions, but had trusted the churchwardens to deal with a multitude of other sins, images that were beyond his reach without a ladder, or which would be too time-consuming. This was common practice - after all, the churchwardens of Suffolk were generally equally as puritan as Dowsing. 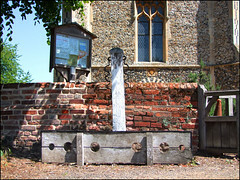 It was assumed that people in such a position were supporters of the New Puritan project, especially in East Anglia. Dowsing rarely revisited churches. But, for some reason, he felt he had to come back here to make sure that his orders had been carried out. Why was this? In retrospect, we can see that Ufford was one of less than half a dozen churches where the churchwardens were uncooperative. Elsewhere, at hundreds of other churches, the wardens welcomed Dowsing with open arms. And Dowsing only visited churches in the first place if it was thought there might be a problem, parishes with notorious 'scandalous ministers' - which is to say, theological liberals. 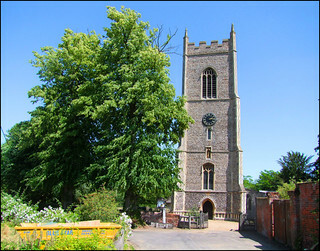 Richard Lovekin, the Rector of Ufford, had been turned out of his living the previous year, although he survived to return when the Church of England was restored in 1660. But that was in the future. Something about his January visit told Dowsing that he needed to come back to Ufford. Standing in the nave of the Assumption today, you can still see something that Dowsing saw, something which he must have seen in January, but which he doesn't mention until his second visit, in the entry in his journal for August 21st, which appears to be written in a passion. 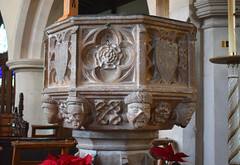 This is Ufford's most famous treasure, the great 15th century font cover. It rises, six metres high, magnificent and stately, into the clerestory, enormous in its scale and presence. In all England, only the font cover at Southwold is taller. The cover is telescopic, and crocketting and arcading dances around it like waterfalls and forests. There are tiny niches, filled today with 19th century statues. 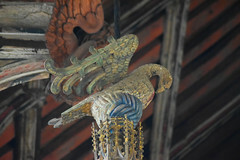 At the top is a gilt pelican, plucking its breast. Dowsing describes the font cover as glorious... like a pope's triple crown... but this is just anti-Catholic innuendo. The word glorious in the 17th century meant about the same as the word 'pretentious' means to us now - Dowsing was scoffing. But that was no reason for him to be offended by it. 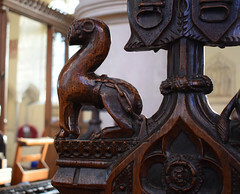 The Anglicans had destroyed all the statues in the niches a century before, and all that remained was the pelican at the top, pecking its breast to feed its chicks. 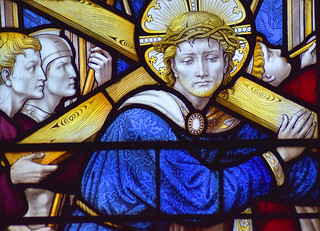 Dowsing would have known that this was a Catholic image of the Sacrifice of the Mass, and would have disapproved. But he did not order the font cover to be destroyed. 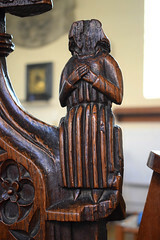 After all, the rest of the cover was harmless enough, apart from being a waste of good firewood, and the awkwardness of the Ufford churchwardens seems to have put him off following through. He never went back. 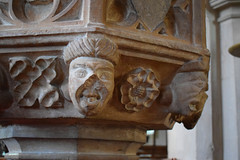 Certainly, there can have been no theological reason for the churchwardens to protect their font cover. 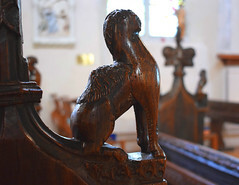 I like to think that they looked after it simply because they knew it to be beautiful, and that they also knew it had been constructed by ordinary workmen of their parish two hundred years before, under the direction of some European master designer. They protected it because of local pride, and amen to that. 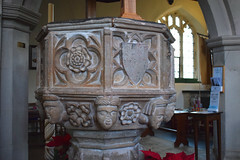 The contemporary font beneath is of a type more familiar in Norfolk than Suffolk, with quatrefoils alternating with shields, and heads beneath the bowl. While the font cover is extraordinary, and of national importance, it is one of just several medieval survivals in the nave of the Assumption. 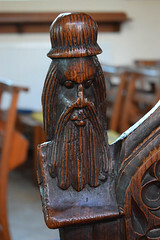 All around it are 15th century benches, with superbly characterful and imaginative images on their ends. 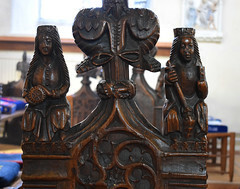 The best is the bench with St Margaret and St Catherine on it. This was recently on display at the Victoria and Albert Museum as part of the Gothic exhibition. 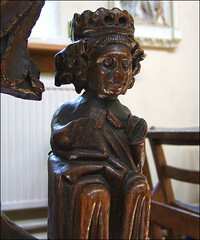 Other bench end figures include a long haired, haloed woman seated on a throne, which may well be a representation of the Mother of God Enthroned, and another which may be the Coronation of the Queen of Heaven. There is also a praying woman in a butterfly headdress, once one of a pair, and a man wearing what appears to be a bowler hat, although I expect it is a helmet of some kind. His beard is magnificent. 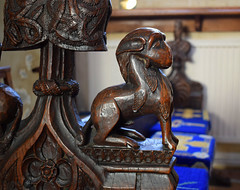 There are also a number of finely carved animals, both mythical and real. 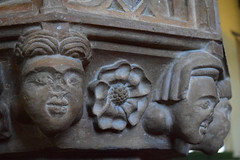 High up in the chancel arch is an unusual survival, the crocketted rood beam that once supported the crucifix, flanked by the grieving Mary and John, with perhaps a tympanum behind depicting the last judgement. These are now all gone, of course, as is the rood loft that once stood in front of the beam and allowed access to it. But below, the dado of the screen survives, with twelve panels. Figures survive on the south side. They have not worn well. 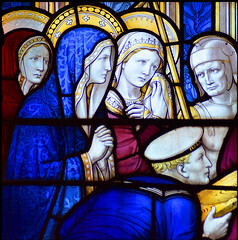 They are six female Saints: St Agnes, St Cecilia, St Agatha, St Faith, St Bridget and, uniquely in England, St Florence. Curiously, the head of this last has been, in recent years, surrounded by stars, in imitation of the later Our Lady of the Immaculate Conception. Presumably this was done in a fit of Anglo-catholic enthusiasm about a century ago. 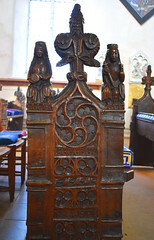 The arrangement is similar to the south side of the screen at Westhall, and it may even be that the artist was the same. 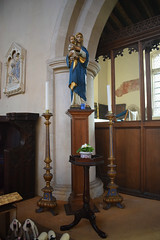 While there is no liturgical reason for having the female Saints on one side and, presumably, male Saints on the other, a similar arrangement exists on several Norfolk screens in the Dereham area. Much of the character of the church today comes from it embracing, in the early years of the 20th century, Anglo-catholicism in full flood. It is true to say that, the later a parish took on the tradition, the more militant and intensely expressed it was, and the more evidence there is likely to be surviving. 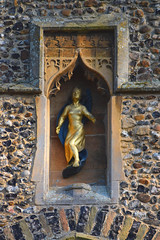 As at Great Ryburgh in Norfolk, patronage here ensured that this work was carried out to the very highest specification under the eye of the young Ninian Comper. Comper is an enthusiast's enthusiast, but I think he is at his best on a small scale in East Anglia like here and Ryburgh. 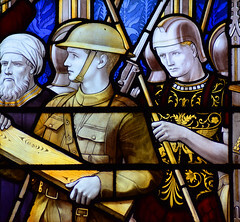 His is the extraordinary war memorial window and reredos in the south aisle chapel, dedicated to St Leonard. 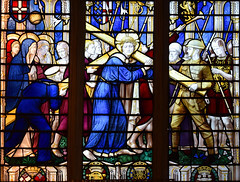 The window depicts Christ carrying his cross on the via dolorosa, but he is aided by a soldier in WWI uniform and, behind him, a sailor. 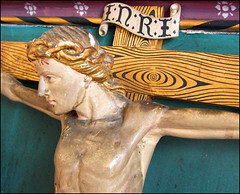 The use of blues is very striking, as is the grain on the wood of the cross which, incidentally, can also be seen to the same effect on Comper's reredos at Ryburgh. 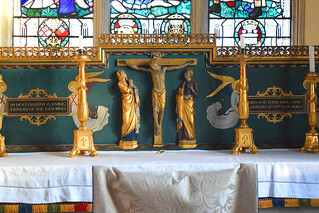 The elegant, gilt reredos here profides a lovely foil to the tremendous window above it. 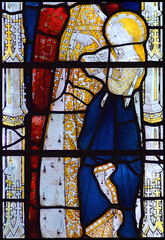 Comper's other major window here is on the north side of the nave. This is a 1901 depiction of the Annunciation, although it is the figures above which are most extraordinary. They are two of the Ancient Greek sibyls, Erythrea and Cumana, who are associated with the foretelling of Christ. 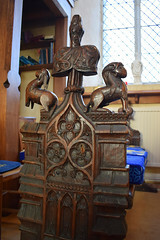 At the top is a stunning Holy Trinity in the East Anglian style. There are angels at the bottom, and all in all this window shows Comper at the height of his powers. 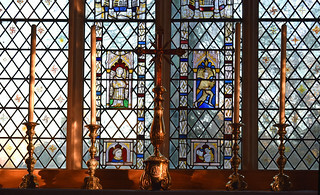 Stepping into the chancel, there is older glass - or, at least, what at first sight appears to be. Certainly, there are some curious roundels which are probably continental 17th century work, ironically from about the same time that Dowsing was here. 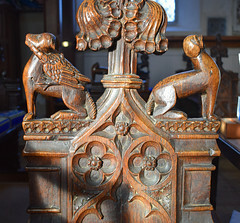 They were probably acquired by collectors in the 19th century, and installed here by Victorians. 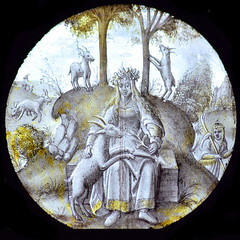 The image of a woman seated among goats is curious, as though she might represent the season of spring or be an allegory of fertility, but she is usually identified as St Agnes. It is a pity this roundel has been spoiled by dripping cement or plaster. 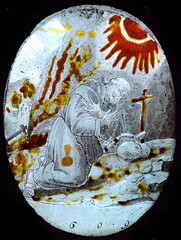 Another roundel depicts St Sebastian shot with arrows, and a third St Anthony praying to a cross in the desert. 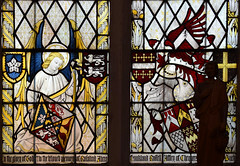 The two angels in the glass on the opposite side of the chancel are perhaps more interesting. 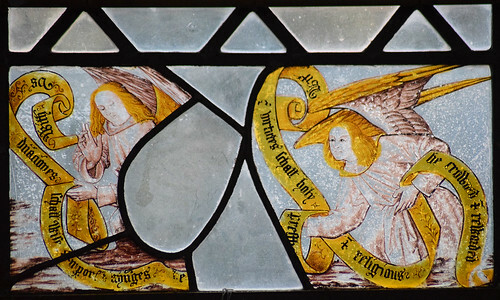 They are English, probably early 16th Century, and represent two of the nine Orders of Angels, Dominions and Powers. They carry banners written in English declaring their relationships to earthly kings (Dominions) and priests and religious (Virtues). 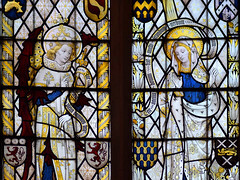 They would have been just two of a set of nine, but as with the glass opposite it seems likely that they did not come from this church originally. 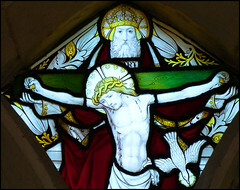 However, the images in 'medieval' glass in the east window are entirely modern, though done so well you might not know. 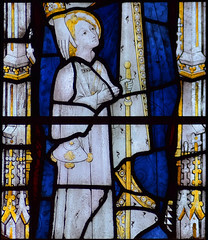 A clue, of course, is that the main figures, St Mary Salome with the infants St James and St John on the left, and St Anne with the infant Virgin on the right, are wholly un-East Anglian in style. In fact, they are 19th century copies by Clayton & Bell of images at All Souls College, Oxford, installed here in the 1970s. 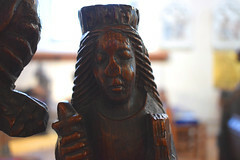 I think that the images of heads below may also be modern, but the angel below St Anne is 15th century, and obviously East Anglian, as is St Stephen to the north. High above, the ancient roofs with their sacred monograms are the ones that Dowsing saw, the ones that the 15th century builders gilded and painted to be beautiful to the glory of God - and, of course, to the glory of their patrons. Rich patronage survived the Reformation, and at the west end of the south aisle is the massive memorial to Sir Henry Wood, who died in 1671, eleven years after the end of the Commonwealth. It is monumental, the wreathed ox heads a severely classical motif. Wood, Mortlock tells us, was Treasurer to the Household of Queen Henrietta Maria. 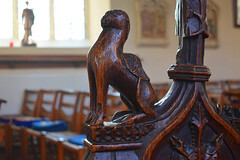 There is so much to see in this wonderful church that, even visiting time and time again, there is always something new to see, or something old to see in a new way. It is, above all, a beautiful space, and, still maintaining a reasonably High worship tradition, it is is still kept in High liturgical style. It is at once a beautiful art object and a hallowed space, an organic touchstone, precious and powerful.